A relatively new addition to the Coriole range and only the second release - this the only planting in McLaren Vale, too, I'm led to believe. Across the country, there are almost a dozen plantings including the Barossa and Hunter Valley, Adelaide Hills, Mudgee and Heathcote. 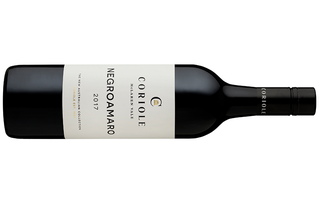 As per the Coriole website: Negroamaro is native to the warm climate of Puglia in Southern Italy, where it is known for producing highly aromatic, deep coloured wine. In McLaren Vale, Negroamaro is a late-ripening variety. Those who have never heard of the variety may be asking what it's like? One whiff and I immediately thought of Nero d'Avola. Think red and black fruit plus plums cradled by tilled black earth, cracked pepper and bitter dark chocolate. Beautiful aromas, savoury characters are the hero with dried herbs and dried red flowers meandering through with ease. Red apple like acidity cuts a neat finish as that savoury goodness lingers. A delicious wine in many respects and one which will accompany a range of food even better. Drink now to five years.